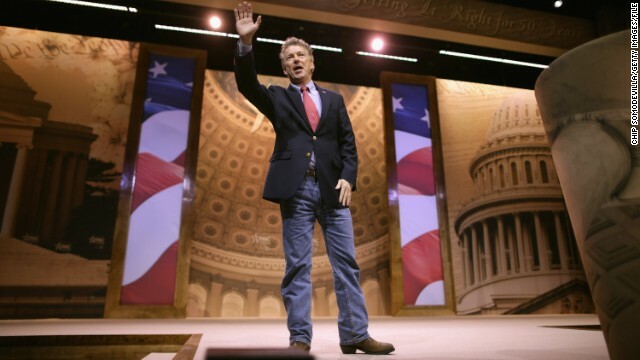 Was Rand Paul's red meat joke a bit too raw? Washington (CNN) - More than any other Republican lawmaker, Sen. Rand Paul has aggressively gone after nontraditional GOP voters in the past year, trying to lure Democrats and independents into his party's column as he considers a presidential bid. So it seemed odd last week when the libertarian-leaning senator from Kentucky made a partisan joke about the prisoner swap that secured U.S. Army Sgt. Bowe Bergdahl's release. Donna – " Well, the Democrats have foisted the biggest joke of a president on the country ever so they should have a sense of humor by now. " Donna, I understand how (or at least why) you feel. I had the TV on Fox 'News' the other day when the latest jobs report came out ( 4 consecutive months of job growth above 200K), the markets were setting more records, and the skies were Bright and Sunny. But all fox had was Gloom and Doom. Fox: The economy is terrible. And if it is not so TOTALLY terrible, look how long it took to be NOT totally terrible. Etc. And when so many Americans are continually blasted by lies and are too stupid to look for real news elsewhere, whatta ya get?? RIGHTIES!! And hatred of the greatest President since Roosevelt. Well, the Democrats have foisted the biggest joke of a president on the country ever so they should have a sense of humor by now. Right on Donna! Al Gore and the Dems should have been more forceful and DEMANDED that the 2000 Florida recount continue until ALL of the ballots were counted, despite the red (aka Brooks Brothers) riot that broke out at the Supervisor of Elections' office. Had they done so they could have saved us that 8-year long "joke"! As for "hate and anger", you might want to take a quick look in a mirror, babe! "trying to lure Democrats and independents into his party's column as he considers a presidential bid..."
Oh. You mean the part where Rand Paul finally let known what he really thinks of Democrats? Yeah. That'll work to his benefit.